Join the First Contact Day Event celebration from 4/11/19 - 4/18/19! Added an extra character slot. The Kelvin Timeline Intel Dreadnought Cruise now properly closes its deflector blast doors during combat. Discovery era Terrans on Pahvo now use the proper transporter animations when spawning. Updated Memorial Plaque to include Morgan Woodward. Updated Class names for Engineers that were missing the term Officer that is present in the other two classes. 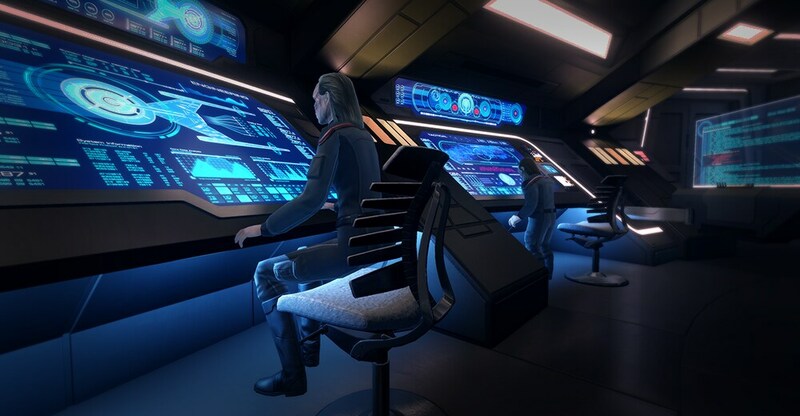 Engineers are now "Engineering Officers", which matches "Science Officers" and "Tactical Officers"
Added missing Tail customization options for Caitian characters. Resolved an issue that was causing Discovery Bridge officer Rank display name and pips in station ability select to not appear properly. The second episode of the Romulan Mystery arc, Taris, has received all new cutscenes. The third episode of the Romulan Mystery arc, Mine Enemy has received all new cutscenes. Addressed an issue that prevented Console players from receiving a trophy/achievement for completion of a tutorial after completing the Discovery tutorial. Resolved an issue found present on all Ground NPCs, Bridge Officers, and some Pets, which was causing abilities that reduced their damage output and/or damage resistances to have less impact than intended. This fix will result in abilities that reduce damage output and/or damage resistances being somewhat more effective than before against these types of NPCs/Boffs. Resolved an issue that caused the Competitive Wargames, Temporal, and Gamma Reputation Ground sets to list 4 items instead of 3. Resolved an issue that caused the Reactive Shield Technology to provide an incorrect amount of shield restoration. Fixed a bug that was causing no assignments to appear in the "Current Map" selection while on DS9's promenade. Resolved an issue that prevented Secondary Deflectors or Drain Infection from critically hitting as much as they should. No longer slows down your weapons. Now only slows down Bridge Officer and Captain abilities while active.